When it comes to setting a good example, you’re the primary role model for your children! That includes your attitude towards dental care, so even if it isn’t your favorite thing to do, approaching it with a light-hearted attitude is a great way to instill the idea that it’s no big deal. Scheduling visits as a family with a dentist in Millburn will encourage your kids to want to get in the dental chair. 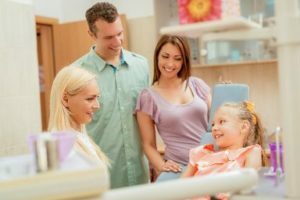 After all, they always want to do what you or their older siblings are doing, so it’s a perfect opportunity for them to be a “big kid” and let a dentist take a look. Also, it’s a lot more convenient to schedule everyone at the same time, and with the same dentist, than to spread those appointments apart! Avoid using any words like “shot,” “pain,” or “hurt.” The last thing you want to do is set up an association that the dentist’s office is a painful or scary place. In fact, you can even describe the cleaning as “having your teeth brushed so they sparkle,” and the exam as having “your teeth counted” to make sure they’re all there. The more you can use kid-friendly language, the more they’ll perceive dental care as easy and fun. Make it fun by focusing on the fun parts of the trip. You’d be amazed at how the simple act of picking out a new toothbrush and toy at the end of the appointment can motivate children! Oftentimes they’ll remember that part more than anything else. By seeing a family dentist in Millburn, you’re getting high-quality, convenient care in a fun environment for everyone. With special touches that appeal to children, as well as a wide variety of adult services, you can rest assured that everyone will get great care. The decision to schedule with a family dentist is clear. With these guidelines, you can look forward to many years of smiles for the whole family! Dr. Robert Schick is a family dentist who loves to work on patients of all ages. He gets immense professional satisfaction from providing entire families with great dental care and knows that it’s more fun and convenient to achieve great oral health when families schedule together. If you have any questions, he can be reached via his website or at (973) 921-9097.